It was one part history lesson, one part pep rally and one part fundraiser. Miller was one of two speakers during a Jan. 26 meeting hosted by Save Our Siesta Sand 2 (SOSS2), a nonprofit organization that has been battling the proposal of the City of Sarasota and the U.S. Army Corps of Engineers (USACE) to dredge about 1.2 million cubic yards of sand from Big Sarasota Pass to renourish an approximately 1.6-mile stretch of South Lido — principally the area depicted on Miller’s slide. 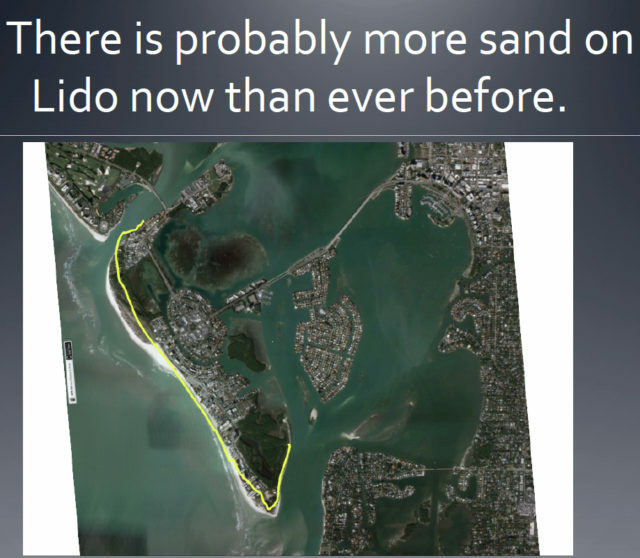 Sarasota County residents are being asked to trust the USACE when it says that removing between 6 million and 7 million cubic yards of sand from Big Pass over 50 years will have no negative impacts on Siesta Key, Lido Key, the pass itself or Sarasota Bay, he said. That volume of sand, Patten emphasized, is the equivalent of four Empire State Buildings. People are being asked to trust “that a desktop computer in Jacksonville will … predict our future,” he said, referring to the USACE District Office whose staff has been working with the City of Sarasota. During a question-and-answer session, audience members asked what they could do to prevent the dredging of Big Pass. 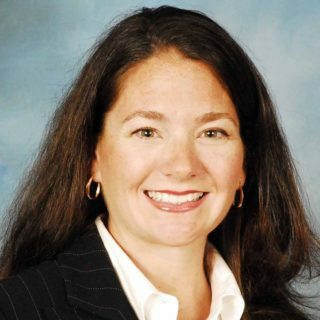 Martha Collins, the attorney for SOSS2, advised them to contact U.S. Rep. Vern Buchanan of Longboat Key. He is chair of the U.S. House Ways and Means Committee, one of the most powerful in Congress, Patten noted. 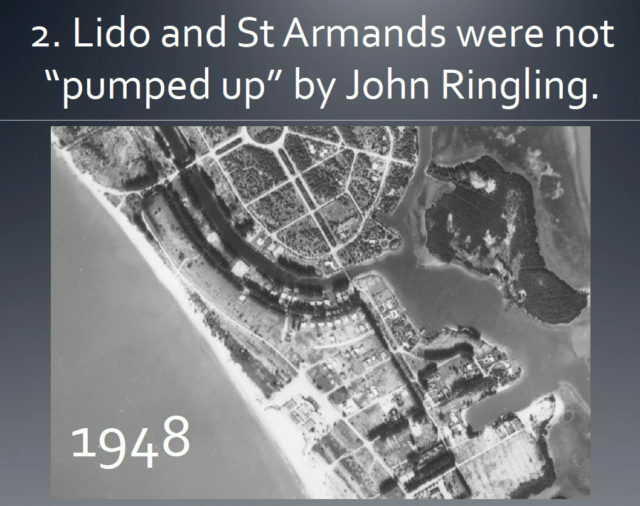 The only way the USACE would develop alternatives to its proposal for Lido in a relatively short time frame, Collins added, would be if Congress insisted it do so. Collins told the audience she has handled a number of cases involving beach renourishment. 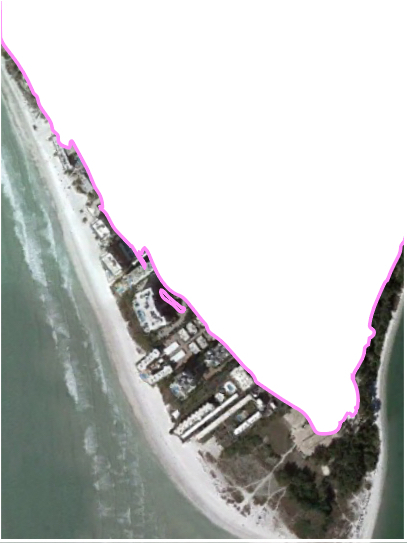 If Siesta’s beaches were damaged by the Lido undertaking, she continued, Siesta then would want sand. 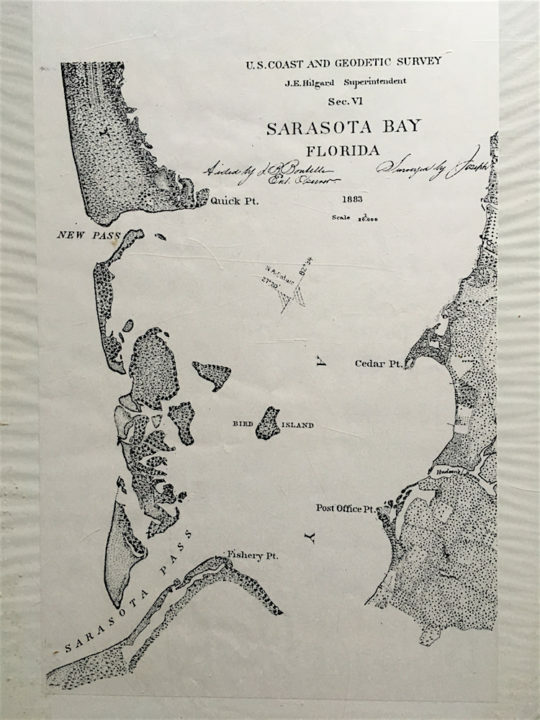 Therefore, she said, the USACE’s thinking is that it would have an opportunity for more work, because it would be asked to design a project for Siesta. Mark Smith, chair of the Siesta Key Chamber of Commerce and a member of the SOSS2 board, explained that the only recourse Siesta residents have had at this point has been the administrative challenge of the Florida Department of Environmental Protection’s (FDEP) Dec. 22, 2016 Notice of Intent that it plans to issue a permit to the city and the USACE for the Lido project. Additionally, the Siesta Key Association (SKA) on Jan. 19 gave the city, the USACE and FDEP 30 days’ notice that it plans to file a complaint in the 12th Judicial Circuit Court in Sarasota, seeking an injunction to stop the state from issuing the permit. 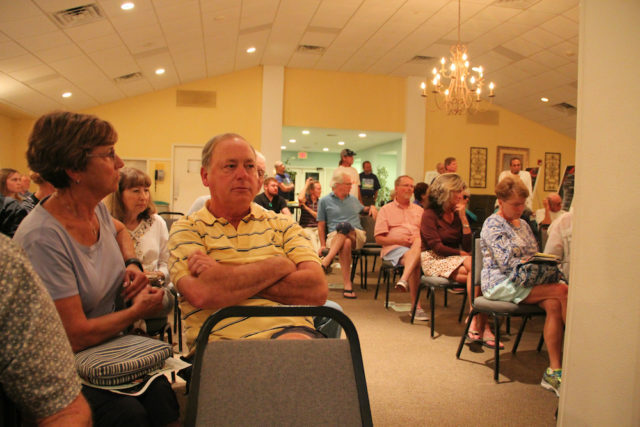 “We want Lido [residents] to have all the sand they need, but not at the expense of damaging Siesta Key,” van Roekens told the audience at the beginning of the meeting. Miller showed the audience a wide array of slides to illustrate his argument; one featured an 1883 map of the Cerol Isles, including Lido. 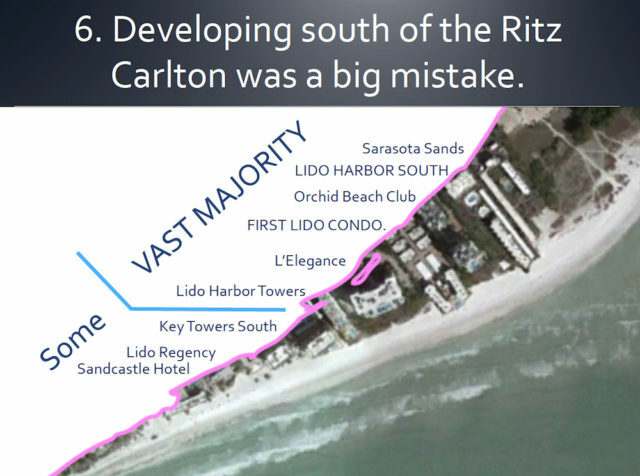 “Developing [Lido Key] south of the Ritz Carlton was a tremendous mistake,” he continued. The distance between the southernmost point of Lido and the north end of Siesta is about 1 mile, he added. The beach in 2016 was twice the width it was in 1989, he said. Last year, the distance from the Gulf of Mexico to Beach Road was 800 feet, Miller told the audience. However, serious erosion is evident on the portion of Siesta right across the pass from Lido. 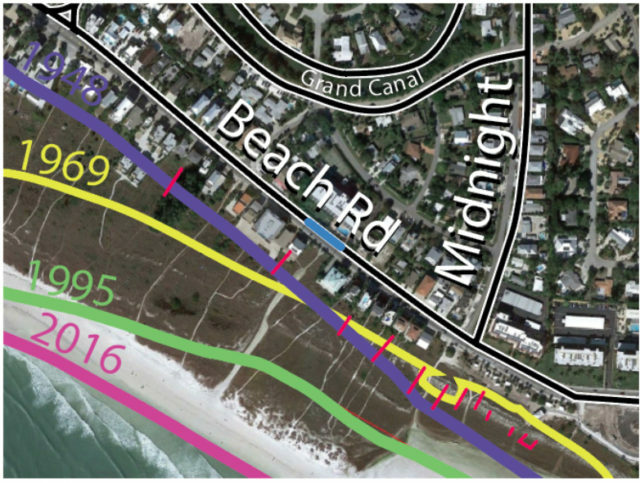 “I’m not sure the city government is treating you all even-handedly,” Miller added, showing slides comparing the eroded areas of Siesta to those on South Lido where the city and the USACE propose the renourishment project. 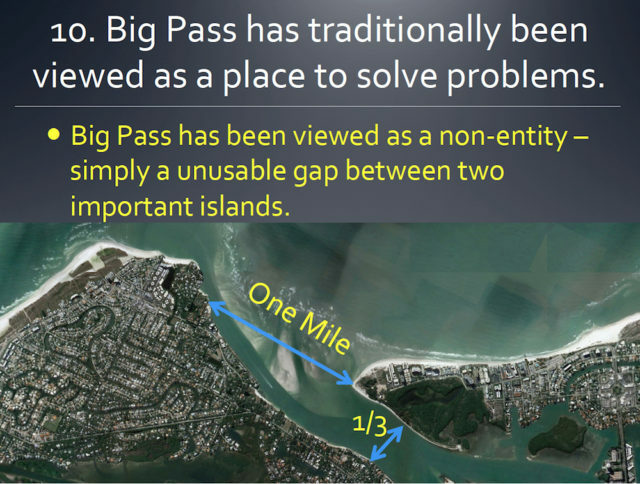 “The shoal helps define the pass, the navigable channel,” Miller continued, and it protects portions of South Lido as well as parts of Siesta Key. Additionally, Miller said, it is habitat for dolphins and spotted eagle rays, among other creatures. Mote Marine has been studying the rays for years, Miller added.